I am admittedly an unabashed believer in the future of inertial sensor tracking technologies, having first worked with this technology over 13 years ago as a research scientist at Callaway Golf. Since then I have also used inertial sensor technologies in prototype evaluations for a high-speed baseball sensor application and with an intelligent knee brace system for potential monitoring and reduction of ACL injuries in football. As I described in the sports science applications post, I believe that inertial tracking technologies should be the first choice for any high-speed sports performance study. I am basing this on my 15+ years experience using all types of motion tracking technologies in advanced sports science applications. While optical, magnetic, and inertial motion tracking technologies all have their strengths and weaknesses, inertial sensors offer the best solutions for quantifiable performance analysis of elite athletes in high speed sports activities. Catapult Sports has become the industry leader in inertial sensor solutions for athlete performance management. Brad Townsend of the Dallas Morning News wrote an article and detailed how Catapult is significantly growing in the US. In 2012 Catapult had one employee and a handful of clients in America with US sales of approximately $140,000. Catapult, with US headquarters based in Dallas, currently has more than 70 US clients, seven employees, and US sales approaching $5 million. They also have plans to expand to 21 employees by the end of 2014. There are rumors that Catapult Sports may even be relocating headquarters to the US in the near future. Catapult Sports is not the only provider of inertial sensing technologies for US professional sports teams though. Stat Sports offers a similar technology but is mainly used in Europe, although they are making inroads in the US. Also, Zephyr Technology offers a physiological status monitoring system (PMS) and also have a few professional teams under contract. Their technology is not a true inertial sensor as they do not include angular rate sensors. I believe inertial sensing technology is approaching the tipping point in athlete performance monitoring with US professional and NCAA teams. I see four main areas of growth potential for inertial sensor technologies in advanced sports science applications. 1.) Existing technology with deeper market penetration – there are a number of avenues in which inertial sensing technology companies can achieve increased market share with their current technology. This falls in line with the quote from Catapult’s Holthouse regarding developing scale and distribution. Following are four specific areas which could provide deeper market penetration in the elite athlete performance monitoring market place. Partnerships with US professional and collegiate sports leagues – most of the US professional leagues are implementing some type of motion tracking initiative for their current or upcoming seasons. The initial impetus seems to be enhancement of the TV broadcasts and increasing the fan experience, and not injury prevention. Radio-frequency identification (RFID) is being used in many applications. This is a technology that is good for tracking positions, but not accelerations. Inertial sensors offer the best solution for any type of analysis that is directly concerned with accelerations. That is why they are used in athlete performance monitoring technologies for injury prevention and optimal dynamic movement patterns and resultant player loadings. Injury analysis really comes down to studying how and if the body is able to decelerate; the human body will only accelerate as fast as it thinks it can decelerate. There is a reason why car air airbag systems use accelerometers and not RFID technology. Following is a review of where each of the main US professional leagues are in regard to player tracking from a league perspective. MLS – the MLS was the first “smart league” in the US when they integrated the adidas miCoach Elite System league-wide for the 2013 season. The MLS miCoach data-tracking technology tracks the athletes’ heart rates, speed, field position, power, acceleration, and other performance metrics in real-time. The current MLS miCoach Elite System does not include the miCoach X_Cell, which is a true inertial sensor. NFL – the NFL installed Zebra Technologies’ real-time location system (RTLS) in 17 stadiums for the 2014-15 NFL season. The 17 stadiums represent the 15 stadiums hosting Thursday night NFL games on the NFL Network this year in addition to Detroit and New Orleans. From the NFL press release, “This partnership is an evolution of the NFL’s initiative to test player tracking in-game, and will be the broadest deployment of a system to date.” Zebra uses RFID transmitters placed inside both the right and left shoulder pads of each player to capture real-time in-game player location measurements. Zebra’s technology can measure position, speed, and distance data. The key to this initiative is simply the fact that the NFL is even open to testing player tracking in-game. While the RFID technology is a start, I still believe that inertial sensors offer the best long-term solution for the NFL, primarily because of the number and severity of injuries. RFID does not provide the necessary and right type of information for an elite athlete performance monitoring system. While the NFL is obviously concerned about injury prevention stemming from the recent concussion lawsuits, their reactions may not actually be helping the injury incidence rate. As Dr. David Chao (@profootballdoc) wrote in his NFP Monday Morning MD article, “Unfortunately, the new Collective Bargaining Agreement’s transition to limited practice time and contact has not served to reduce frequency.” Inertial sensor tracking technologies can actually examine the mechanism of dynamic injuries, as will be discussed later. With the recent advent of player safety penalties such as targeting, inertial sensor systems could even be used in a league judicial situation, where players facing hefty fines could use in-game inertial data to show that they truly were trying to decelerate prior to hitting the opponent. NHL – it was recently reported that the NHL is investigating a system that would put a small chip or RFID tag on players as a means to track on-ice movements and collect information during games. This is very similar to the initial implementation that the NFL is doing. The NHL version will have RFID tags placed on players’ shin guards during game action. The technology is currently being tested by Quantum Pro Hockey. NBA – Injury prevention analytics has become the hottest trend in the NBA in the past year. The NBA was the first major professional league to quantify and analyze player movement in live game action with installation of SportVU tracking systems in every NBA arena. Catapult recently announced they have agreed to a partnership that will integrate SportVU 3D-tracking data from games and their own player tracking data from practices into one package for NBA teams. Catapult will integrate their analytics platform within STATS ICE (Interactive Collaboration & Evaluation) Basketball personnel management system, as all of the NBA teams are already familiar with that system. Catapult’s system is more precise and can provide player work loads which SportVU cannot; however, the NBA currently does not allow electronic tracking devices in games. Many teams are hoping commissioner Adam Silver will lift the ban on tracking devices in games, as the D-League already has this past season. There are obstacles that the league faces regarding player tracking as any agreement will have to be collectively bargained. The players union seems to be the biggest hurdle to adopting wearable technology for this upcoming season. MLB – MLB continues to live in the relative dark ages of sports science, as they typically employ measurement technologies that have already been implemented by other leagues years ago. At last year’s MIT Sloan Sports Analytics Conference, MLB Advanced Media (BAM) announced the rollout of a new system for measuring everything from a fielder’s speed to track down the ball to the efficiency of his route to the distance he covers. The system combines data from a ChyronHego binocular camera system and Trackman radar data. However, BAM had already been working on a Fieldf/x system with Sportsvision since 2011. The Fieldf/x system costs over $100,000+ per stadium to install. Both systems produce a TON of data, ranging from 2 TB of data per game for the Fieldf/x system to 7 TB of data per game for the new system. That is a lot of money and a lot of data for a technology that seems to be behind the times. Similar to optical motion capture cameras, camera based systems are much more expensive than other technologies and are dedicated to the installation site. Given the benefits of wearable player tracking technologies, it seems like a waste of resources to spend money on developing a camera based player tracking system, much less two competing ones. Obviously some type of camera system would still be required for tracking ball flight, but it would not nearly require the cost and data requirements of also tracking players. I have never really understood why baseball continues to operate a decade behind other leagues in regards to the use of technology for increasing player performance while reducing significant injuries. They only seem focused on enhancing TV broadcasts and the fan experience. Deeper market penetration within US professional sports leagues – this is a relatively easy growth channel, especially for Catapult. As Holthouse said, they are focusing on scale and distribution. Their technology has proven to be a huge success with a number of high visibility teams in the US using their systems. US professional teams have proven be copy cat organizations, and the non-users will feel as though they are being left behind if they don’t get on board soon. Catapult’s partnership with SportVU provides it with a lot of leverage in the NBA as all NBA teams are familiar with using STATS ICE Basketball personnel management system. The other US professional sports leagues have chosen other player tracking technologies, but none of those provide the athlete performance monitoring solutions that Catapult does through its’ combination of inertial sensors and Inertial Motion Analysis (IMA) Kalman filtering algorithm. I also believe that NCAA programs offer a huge opportunity for growth. Costs of the system can potentially be shared by a few programs within the same university, thereby offering performance management solutions for even smaller schools with more limited individual athletic budgets. Partnership with sports media providers for enriched broadcast presentation and analysis – this market is directly tied to the previous discussion on league partnerships. This will require professional sports league agreements; however, that would also seem to be a rather large impetus for the leagues to adopt wearable technologies during game action. We have already seen the effect that Sports Vision’s PITCHf/x and 1st & 10 Line have had on enriched broadcasts. The SportVU tracking system also provides broadcast solutions that deliver meaningful graphical content to enrich the viewer experience, including branding and sponsorship opportunities. Broadcast networks will all have access to the data provided by their respective leagues, but what’s not known is if and when they would choose to include it as part of their on-air graphics as there are concerns of cluttering their telecasts. The NFL and their broadcast partners currently have access to Zebra Technologies RFID data, and to date they are only showing certain plays with speed and routes as the primary focus. Player tracking data could also be integrated into mobile applications for increasing the fan experience. Direct measurement of local body segments – one of the biggest advantages that inertial sensors provide is that they directly measure angular rates and accelerations relative to the local body segment coordinate system. That is why I prefer this technology to any other motion tracking technologies as we get a direct measurement of how the human body actually moves. Providing local body segment angular rates and accelerations would provide powerful data for profiling athletes, examining dynamic mobility and stability at joints, and analyzing dynamic competitive movements to examine the efficiency of their movement patterns and resultant loadings. While the current Catapult configuration provides powerful data in terms of an athlete’s readiness to play, this configuration would get into the efficiency of the athlete’s underlying mechanics at a body segment and joint level. And that is where the catastrophic ligamentous injuries occur. Motus Global has already announced the development of their MLB Pitch Sleeve which incorporates an inertial sensor at the elbow. This is exactly the type of body segment inertial analysis that I am referring to. Another example would be analyzing dynamic knee valgus which is an indicator of potential ACL injury due to an inefficient movement pattern. 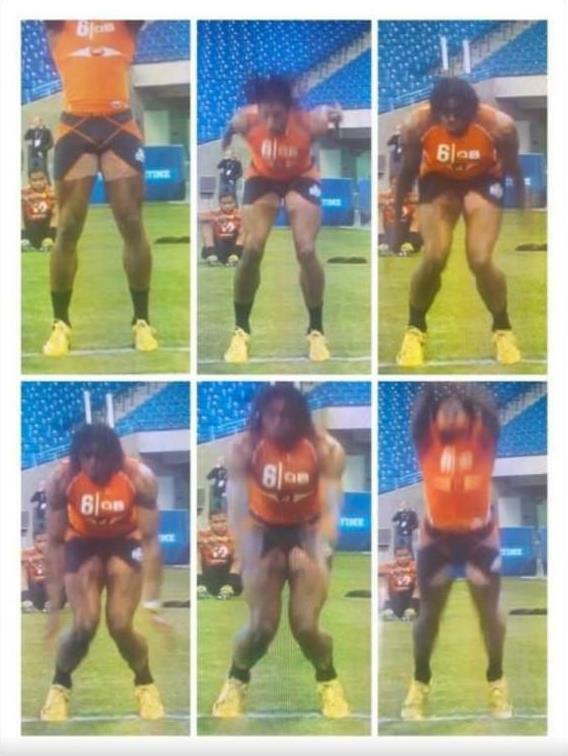 The following picture sequence is of RG III at the NFL Combine. He exhibits very inefficient and dangerous mechanics with extreme knee valgus in this jump sequence. Direct dynamic angular rate measurements would red flag this immediately. The inertial sensor and the athlete’s ACL don’t care where the athlete is on the field or what direction he is facing. A ligament injury only cares about directional loading relative the anatomical axes and not where it is on the field. What is important for analyzing ligamentous injury mechanisms, is to know the angular velocities across the joint during high speed movements and loadings. By orienting the inertial sensor properly, direct measurement of these measurements is instantaneous and very simple. This can be accomplished across any joint using the existing sensors. This type of of analysis could also be used at a combine or testing event to quantify the efficiency of players’ joint movements and loadings. Rather than watching the DBs turn and run, one could actually measure the dynamic hip angular velocity in and out of his turns. 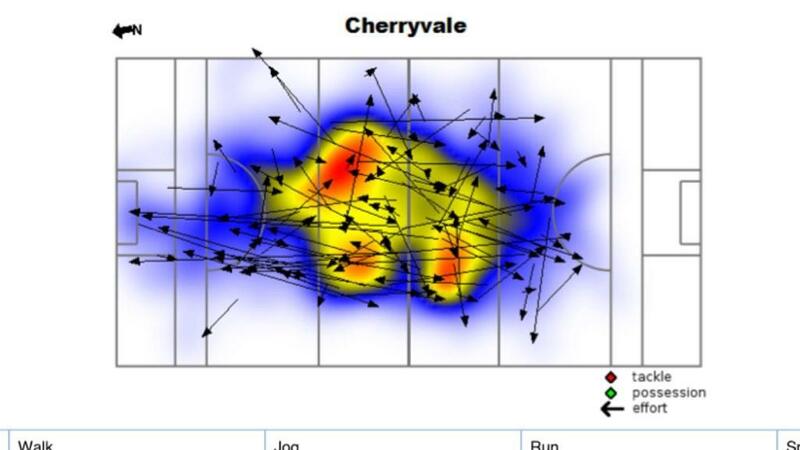 It would turn a combine into an actual quantifiable performance analysis. It could also be used in practices to analyze functional repetitions. An advanced measurement that I like to use to quantify athleticism in one-on-one athletic situations is reactive acceleration. Acceleration is an important parameter for evaluating an athlete as it directly affects the athlete’s ability to produce force and torque. Reactive acceleration provides a temporal quantity to acceleration and shows how quickly the athlete can respond to dynamic game situations. This is an advanced skillset that can be worked on in practice situations and real-time inertial sensing in this type of application would provide immediate feedback. Player profiling studies using direct sensor measurements – as an extension of the previous section, direct measurement of angular rates is a very powerful tool for player profiling. I have successfully used direct measurement of local body or club segment angular rates for profiling golf swings and for ACL injury mechanisms. It could also easily be used for profiling baseball pitchers. For example, an appropriately rated angular rate sensor on the humerus could provide real-time internal shoulder angular velocity values for pitcher profiling studies. These would be accurate and repeatable measurements that could be compared to other pitchers as well as repeatability of the same pitcher over time and for different pitches. This would be very different than the many optical motion capture system studies out there that promote high angular velocity rates that do not represent true internal shoulder rotational angular rates and are not very repeatable. Combining or plotting two angular rate measurements is even more powerful as it provides great insight into the 3D dynamics of the athletic movement and presents a very powerful profiling tool. I used wrist release rates plotted against shaft closure rates to develop golfer swing profiles that were used in conjunction with dynamic swing models. Similarly, internal shoulder rotation angular rates plotted versus forearm pronation angular rates would provide great insight into different pitch types. Or internal shoulder rotational angular velocity plotted versus elbow extension angular velocity would provide greater insight into valgus extension overload injuries. There are many other possibilities to examine as well, all much more powerful than trying to profile athletes on resultant 3D positions of the body from an underlying skeletal structure that only allows rotational degrees of freedom. One of the reasons we have such a big data problem in sports analytics is that most data scientists are trying to make decisions with the wrong data. This type of application of inertial sensors provides smart player input data thereby eliminating the need for the other irrelevant output data. 3.) Multi-sensor applications for motion tracking and relative body segment measurements – currently the inertial sensor systems used in athlete performance monitoring scenarios like Catapult and Stat Sports only use 1 sensor positioned between the shoulder blades. There are limitless possibilities if multiple sensors were used, including up to a full body motion tracking solution, though in most applied sports science applications that would just be overkill. Currently XSENS offers full body inertial sensor motion tracking solutions for 3D human kinematic analysis. By using two inertial sensors, it would be possible to examine more detailed loading across joints or body segments. While the MLB Pitch Sleeve is using the correct type of technology, I believe that it should use inertial sensors on both the humerus and the forearm. While inferences can be made about joints and body segments upstream (more proximal) or downstream (more distal) due to the kinematic chain of the human body, inertial sensors on both segments of a joint provide much more detail on joint loading, and thus ligament loading. I employed the same type of measurement system in an intelligent knee brace system project. An injury mechanism never knows if improper muscle activation at the proximal or distal segment will cause the joint ligament injury, as that is often what contributes to fatigue-based ligament injuries. The current Catapult configuration can identify general inefficiencies in acceleration between left and right side movement patterns in a macro-analysis. They also claim that their Kalman filtering algorithm is intelligent enough to determine extremity results from a single sensor. For example, they claim they can predict a baseball pitch velocity from one sensor on the back, or they can determine a hamstring is susceptible to a potential fatigue injury by measuring a shorter dynamic stride from the same back sensor. While I do believe that they can infer that from an appropriately designed inertial sensor, a two sensor measurement system could more quickly and efficiently quantify where the differences are across a joint in a micro-analysis and how to treat them. This data would also be extremely invaluable in detailed biodynamic simulations. A good example of the potential of this is the effect of scapulo-humeral rhythm fatigue in pitchers performed using an XSENS inertial motion tracking system. Also, a coach could examine X-factor stretch between hip and shoulder angular rates in the transverse plane, and could quantify the Kinetic Link in rotational sports movements. The same inertial sensor that monitors an athlete’s ability to perform optimally in their next game, could also be used to measure detailed high-speed joint movements, analyze shooting mechanics in basketball, swing mechanics in baseball, or throwing mechanics in football. 4.) Amateur athlete system – a similar sensor design with associated software with less bells and whistles and support could be marketed for amateur athletes. Adir Shiffman is the Chairman of Catapult Sports. Shiffman has given some seemingly contradictory statements about market penetration of Catapult Sports technologies beyond professional sports teams. In a May 22nd article, Shiffman said, “I feel the excitement around wearables is just general activity fracas and may or may not turn out to be a real market. The market potential feels huge, but I’ve yet to meet a single person who’s said a wearable technology has changed my life. When consumers get a wearable they’re initially excited, and then they start to wonder if it can help you over the long term. I think that’s the challenge with wearables.” However, in another interview, Shiffman says that he believes US high school sports programs and elite Australian schools could be likely customers in the near future. Shiffman says, “The key to a technology for committed amateurs is to build hardware and software that solves real problems these guys have.” Shiffman adds, “In the not-too-distant future there will be the opportunity for very committed amateurs to access a version of our platform based on that [used by] the elite guys.” There definitely seems to be a market for high priced amateur athletic performance tools for those elite amateur athletes looking to get to the next level. However, I would assume that there would have to be some modifications to the Software as a Service (SaaS) model currently used with professional US sports teams as they are paying a premium for the predictive analytics functionality. It will be interesting to see what the future of inertial sensors in sports science applications holds. I believe that we will see many of these areas of growth realized in the not too distant future in some capacity. The wearable tech industry will most likely continue to see a consolidation of companies as Catapult CEO Holthouse has said. As highlighted previously, there are many different types of motion tracking technologies being employed by US professional leagues. While many are in the exploratory phase, they are getting to the point that decisions will be made regarding the choice of technology moving forward. Professional teams will always be looking for the next great thing out there to help prevent injuries in their athletes but also to get them to perform at their best. Inertial sensing provides the best solution for this, but the question is will the leagues recognize that the value of injury prevention for their athletes is more important than a cheaper solution that provides immediate TV broadcast enhancement. Another thing to follow is if a major consumer brand tries to buyout Catapult or any of the other competing companies. Catapult Chairman Adir Shiffman has said, “Every tier-one venture capitalist in US has approached us to make an investment and we haven’t taken any of those investments and we haven’t entertained any offers. We are endlessly contacted by consumer brands; [an alliance] is not out of the question but it needs to be more substantive to be interesting to us.” Adidas already has their miCoach technology that they have developed in-house. They also have their miCoach X_Cell, which is a true inertial sensor that can be used for many of the applications that I described previously. Nike does not currently have a commercially available inertial sensing technology. In fact, they recently cut their workforce dedicated to their FuelBand technology, but also announced Nike+Fuel Lab which is a third-party developer recruitment center. Reading both articles suggests that Nike may continue hardware development but use third-party developers and apps to provide the software. A recent job positing for an Algorithm Engineer Nike+ seems to further validate that thought. That is a completely different philosophy than Catapult Sports which uses SaaS and cloud computing to provide predictive analytics to teams. Under Armour could also be another US consumer brand that could be a potential partner. They have proven to be a performance enhancement and innovation company and are continually looking for avenues to grow their business. At the end of last year they bought MapMyFitness, in which CEO Kevin Plank talked about providing measurement and analytic needs for all athletes. It will be very interesting watching the growth of inertial sensing technologies in the professional US sports marketplace in the next year. Between Catapult Sports US expansion and the coming introduction of the Sleeve from Motus Global, inertial sensor technologies will become more commonplace in US professional sports. The direct measurement of player inputs will provide a much more powerful tool for sports analytics and specifically for predictive analytics capabilities.